The key to preparing delicious seafood occurs before you set foot in your kitchen—you must buy a great piece of fish. If the seafood you start with is not high quality and fresh, the meal you make will fall flat. Unfortunately, many areas do not have top-notch seafood stores. That means most Americans must buy their seafood at supermarkets. This is not necessarily a bad option—some supermarkets have excellent seafood departments—but quality can vary dramatically. Take a whiff as you approach the counter. You should smell ocean brine or nothing at all. If instead you get a low-tide–like fishy odor, walk away—the store does not pay sufficient attention to freshness or cleanliness. Examine whole fish on display—even if you intend to buy a fillet. The fish’s eyes should be bright and clear, not cloudy…scales should be shiny and metallic-looking, not dull. If you can touch the fish, gently press its flesh—if it is fresh, the depression you create will quickly disappear. It speaks poorly of the store if there are past-their-prime whole fish on display. Look for liquid in packaged fish fillets. Tip a few packaged fish fillets to one side. If you see liquid sloshing around, the fillet has been sitting around too long—those are juices that have escaped the fish as it aged and dried out. 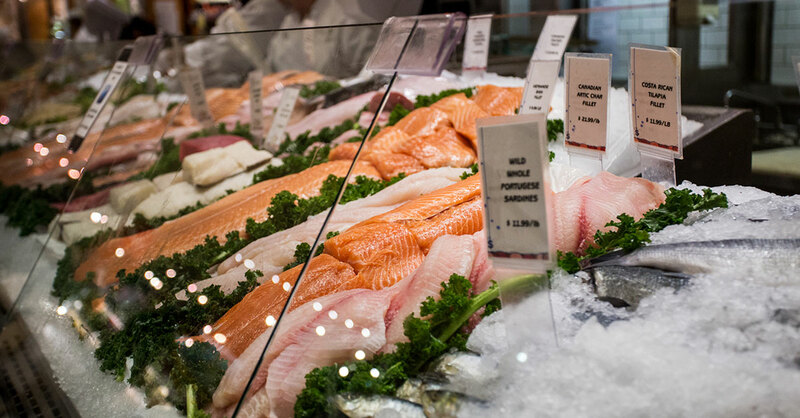 You could simply select a different fillet, but the smarter move is to not buy seafood there at all—liquid in fillet packages is a red flag that a store is not sufficiently focused on freshness. Eye the ice in fish display cases. This ice should look clear. If it is cloudy or yellowed, it likely is not changed very often—another sign of inattention. Notice fish-department traffic. The more customers a seafood department or seafood store has, the faster it will turn over its inventory and the fresher its seafood is likely to be. Be wary if you’ve been to a store several times and rarely see anyone buying fish. Seek out markets that cater to immigrant groups from coastal, seafood-loving nations. I have found that if there’s a market in the area that has a large clientele of people from Portugal, Korea, Vietnam or Italy, for example, it likely is a great place to buy excellent seafood for reasonable prices. Members of these communities tend to be savvy seafood shoppers. And because these groups tend to eat lots of seafood, inventory turnover often is high. Look for a slight blue tint in white-flesh fish. A white, flaky fish such as cod, flounder or haddock should be translucent or such a brilliant white that it seems to have a slight bluish tint. If there’s a slight yellowish tint instead, the fish has begun to oxidize and won’t taste very good. Seek a distant sell-by date. Prepackaged fish should include a sell-by date on the label. But it’s not sufficient that a packaged piece of fish hasn’t passed its sell-by date—you want to find fish that is at least two days away from this date. Warning: If seafood has a far-off sell-by date but seems past its prime, don’t buy it—disreputable stores occasionally repackage fish as it nears its original sell-by date. Don’t be afraid of the word ­“frozen.” When it comes to seafood, fresh is best only if you live very near where that fish was caught. Otherwise you may be better off buying frozen, particularly when the frozen fish is vacuum-sealed and the packaging says it was “flash frozen”—that is, frozen almost immediately after coming out of the water. Warning: When you choose frozen fish, avoid packages that have frost on the fish inside the packaging…and/or where sections of the frozen fish’s flesh appear discolored. These are signs that frozen fish has been sitting around too long. Avoid seafood imported from Southeast Asia. Fishing industry standards and quality controls are not as reliable in Southeast Asia as they are in North, South and Central America. Among other issues, fish imported from Southeast Asia—including from large exporters such as Vietnam, Thailand, Indonesia and China—might not have been frozen promptly and properly, increasing the odds of flavor and safety problems. Warning: Virtually all the tilapia sold in the US is imported from Southeast Asia. Much of the shrimp sold in the US comes from Southeast Asia, too, but it is possible to find shrimp from Mexico, Venezuela or the US Gulf Coast instead. Don’t automatically skip the fish that’s on sale. Buying bargain fish might sound like a bad idea—because fish sometimes is marked down because it is about to go bad. But sometimes the fish that’s on sale is the freshest fish in the store because there have been big recent catches of a certain type of fish and distributors must temporarily slash prices to move this inventory. Avoid exotic or obscure fish unless you have great trust in the store. Some people find it fun to try new foods—but most don’t, which means unusual types of fish tend to sit around in stores longer than well-known types of fish. It’s fine to buy unusual fish if a store you trust assures you that it’s fresh, it’s a fish that is popular in the community that frequents the store (such as whiting in an Italian market or monkfish in an Asian market) and/or you have faith in your fish-selection skills. Buy shellfish that grew in northern waters, especially if you’re planning to enjoy it raw. These are less likely than warm-water shellfish to harbor dangerous parasites, and they often have more flavor, too. Examples: Oysters and mussels from Atlantic Canada or New England are excellent options. • Ask for ice for the trip home. Seafood can significantly degrade in the time it takes to get it home from the store, especially on hot days. Most seafood stores and departments will provide a bag of ice upon request. • Store seafood on ice in your fridge. Unless you’re cooking seafood as soon as you get home, fill a container with ice and put the seafood on this bowl in your fridge. (Wrap the seafood in plastic wrap first if it is not already sealed well.) This ice provides additional cooling—I find that seafood is best stored at around 28°F, which is colder than a fridge on its own. • Defrost frozen seafood in the fridge. This takes longer than defrosting it at room temperature, but it’s safer—there’s increased risk for contamination when you defrost seafood at room temperature. Defrosting in the fridge leads to tastier seafood—too much liquid often drips out when seafood is defrosted at room temperature, taking a lot of the flavor with it. Helpful: The ideal time to cook a piece of seafood that has been frozen is when it is no longer rigid but you can still feel tiny ice crystals in its flesh. If you wait until these ice crystals melt, some flavor will be lost even if you do defrost in the fridge. • Don’t let seafood languish, even frozen. Even frozen, most fish should be kept tightly wrapped and positioned in the back of the freezer where it’s coldest and used within one month for the best flavor.